Gold futures extended their winning streak to four straight sessions and settled at a two-month high as demand for safe-havens climbed. Gold for February delivery tacked on $13.50, or 1.3%, to finish at $1,091.90 an ounce on the Comex division of the New York Mercantile Exchange. The close was the highest since Nov. 5 when gold ended at $1,104.20 an ounce. "The world has begun 2016 in a bad mood and gold is a natural beneficiary," Matthew Turner, an analyst at Macquarie Group Ltd. in London, said by phone according to Bloomberg News. "Because global markets are in this negative mindset, the North Korea nuclear test is more supportive for gold than would have been the case at other times." 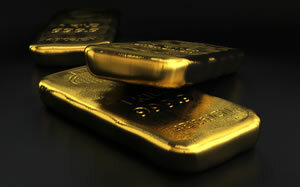 Gold prices ranged from a low of $1,074.40 to a high of $1,094.80. The yellow metal gained 0.3% on Tuesday, 1.4% on Monday and less than 0.1% on Thursday. Higher for a third session in a row, silver for March delivery added a half cent to settle at $13.976 an ounce. Silver prices traded between $13.85 and $14.14. The close was the highest since Dec. 24 when silver ended at $14.379 an ounce. Silver gained 0.9% on Tuesday and 0.3% on Monday. April platinum declined $15, or 1.7%, to $875 an ounce, ranging from $873.70 to $893. Palladium for March delivery tumbled $30.70, or 5.7%, to $505.05 an ounce, trading between $503.10 and $538.55. Gold added $14.40, or 1.3%, to $1,091.40 an ounce. Silver shed a half cent, or less than 0.1%, to $14.01 an ounce. United States Mint bullion sales will take off next Monday, Jan. 11, when newly 2016-coins become available. Most of the 2015-dated issues sold out with product series scoring multi-year highs, like American Gold Buffalo and ATB five ounce silver coins, and an annual record, like American Silver Eagles. Since the Mint’s AP’s haven’t purchased any of the two 2015 gold bullion coins still available in weeks, can you find out how many of the 2015 gold bullion version American Eagle $25 half-ounce & American Buffalo $50 one-ounce coins are still available? The U.S. Mint’s AP’s will have to purchase them eventually as in past years I assume! Thanks so much Mr. Unser.